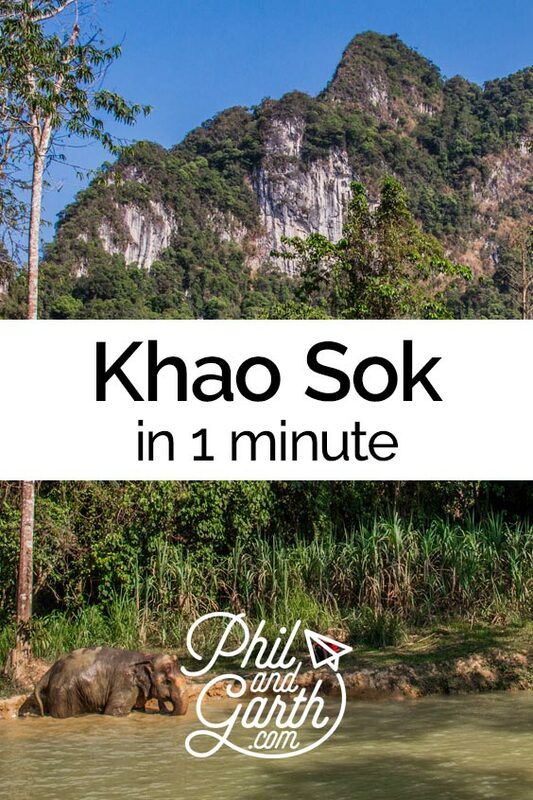 Watch Elephant Hills, Khao Sok in 1 minute or read our travel guide. Khao Sok was the second stop on our Thailand adventure after Bangkok. 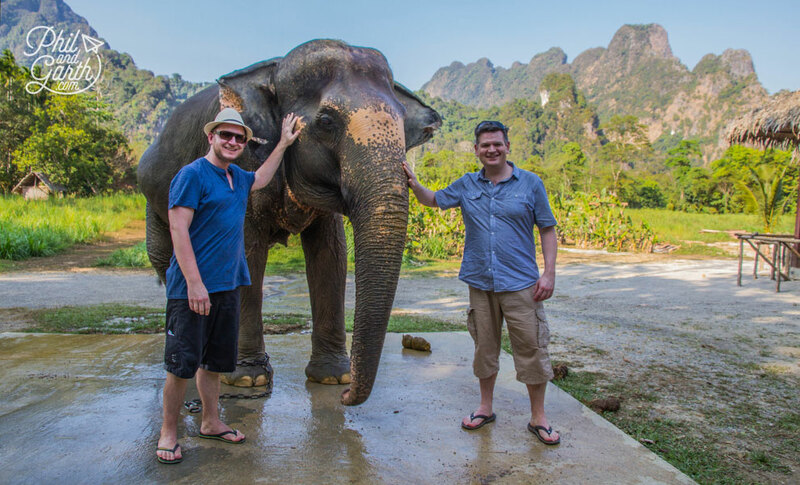 We wanted to see the national animal of Thailand – the elephant! but we’re not comfortable with the idea of riding them. 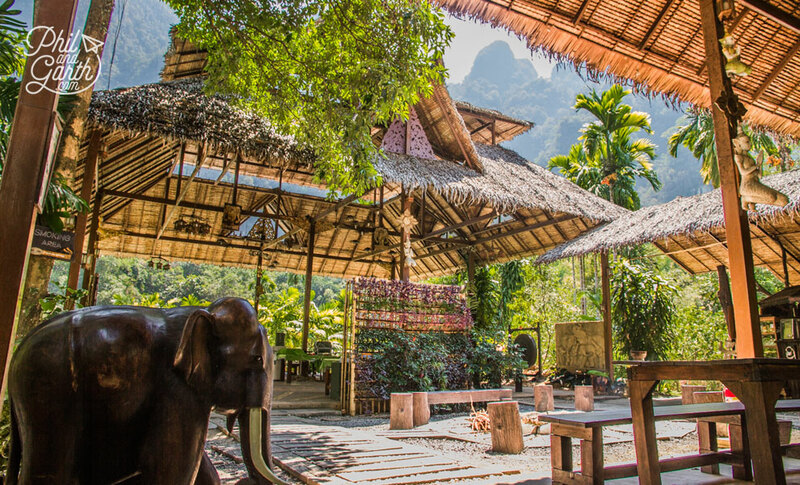 So after reading about the Elephant Hills elephant camp in Khao Sok and how they care for Elephants from the tourist trade, but still allow tourists to interact in a more humane way, like washing them, feeding or bathing with them, it made perfect sense to experience some time in Khao Sok’s lush tropical rainforest. Elephant Hills collected us from Phuket Airport, it was difficult to find our driver as the names he had on his board were all the 2nd persons name, not the lead booker. Our name was also spelt with an unusual spelling which meant we weren’t sure if we’d found the right person. For your info he was standing outside the airport, not inside where the other hotel drivers were, and when we say lots, we mean lots! It all meant we waited quite some time for the other passengers that would be in our mini bus, we’re pretty sure this was due to the unclear signage from the driver. 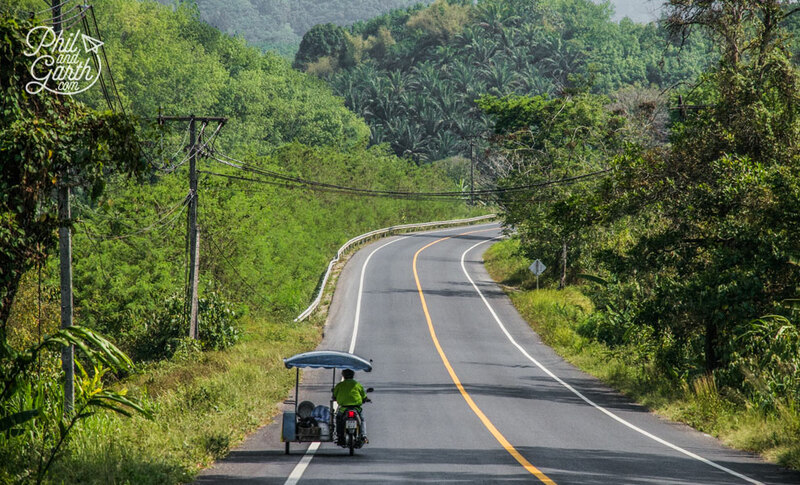 Elephant Hills is located a 3 hour minibus ride from the Phuket airport, which we did in 2 hours! (due to that delay collecting everyone) As you can imagine, the fast speed meant feeling rather sick on the journey, even though we were given water and there was air con, of sorts on the bus. Just arrived at Elephant Hills, Scorchio! However when we did arrive it was absolutely fantastic. 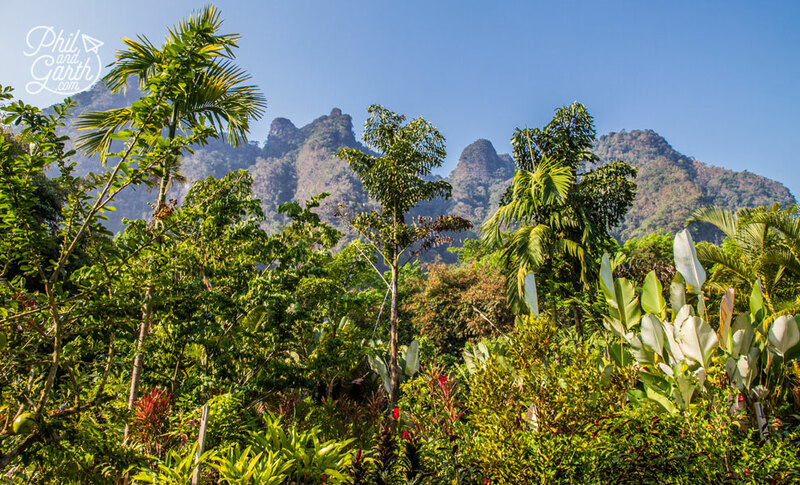 The location was right in the middle of the jungle – Khao Sok National Park, which is the largest rainforest in Southern Thailand. Oh boy it was hot when we arrived! The main area that serves as bar, restaurant and meeting area was light and airy, with a lovely smell of the wooden fire which doubled up to keep those pesky mosquitoes away. The Elephant Hill swimming pool had views to die for! 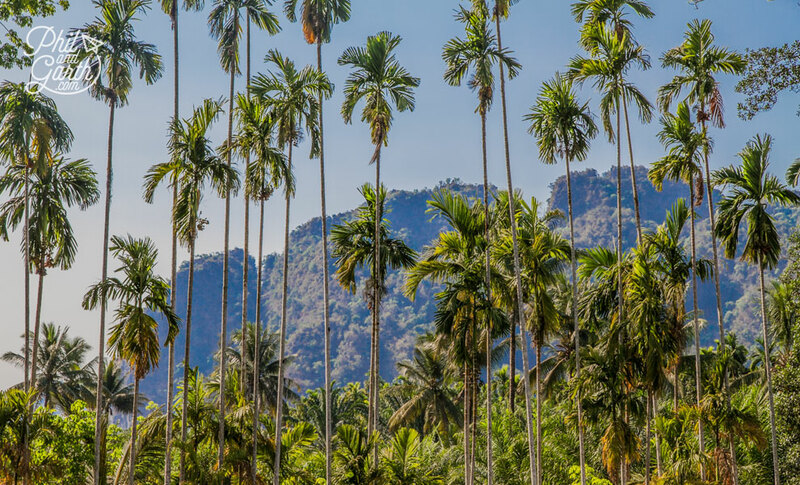 With limestone tree clad mountains in the distance and towering palms in the foreground, it doesn’t get much better than this! incredible. We’ve never been in a pool like it. 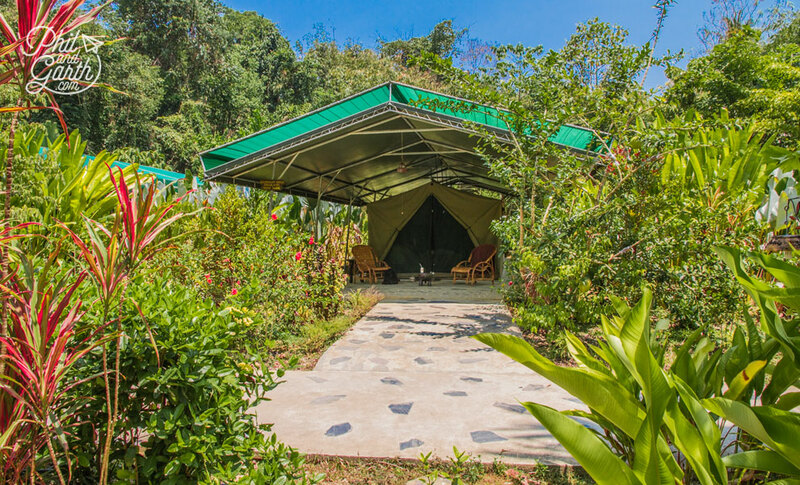 Our tent has to be the ultimate in glamping, it even had its own terrace! 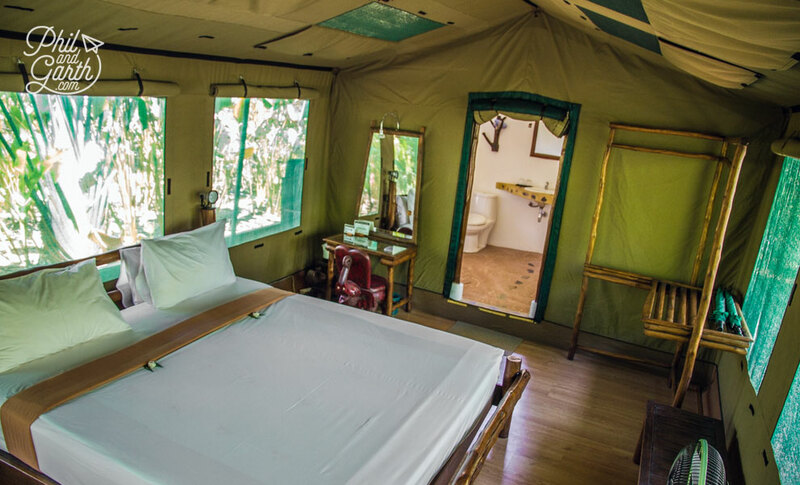 We stayed at their Elephant Camp which had around 30 tented bedrooms. They were surprisingly cool, even though as you’d expect being in the jungle there was no air conditioning, or other modern comforts, although we did have an electric fan that we left on in the night. As we are officially two wimps frightened to death of bugs and creepy crawlies, it was good to see or not see anything too yucky! Only a gecko on the terrace and a fly type thing on the outside of our tent the next day that just sat there all day! It did feel quite sealed from bugs, although I’m sure they were really everywhere! If you love gardening, then all the exotic plants and flowers are on the doorstep of your tent, they will excite you as they did Garth. They also had a kitchen herb garden not far where we saw pineapples growing, which we’d never seen before. 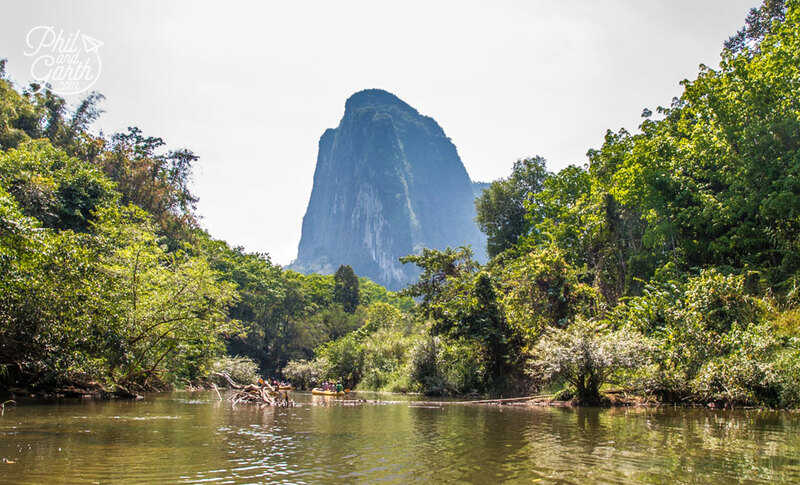 For our first activity we were taken on a leisurely canoe ride along the River Sok. Someone did the paddling which was great! 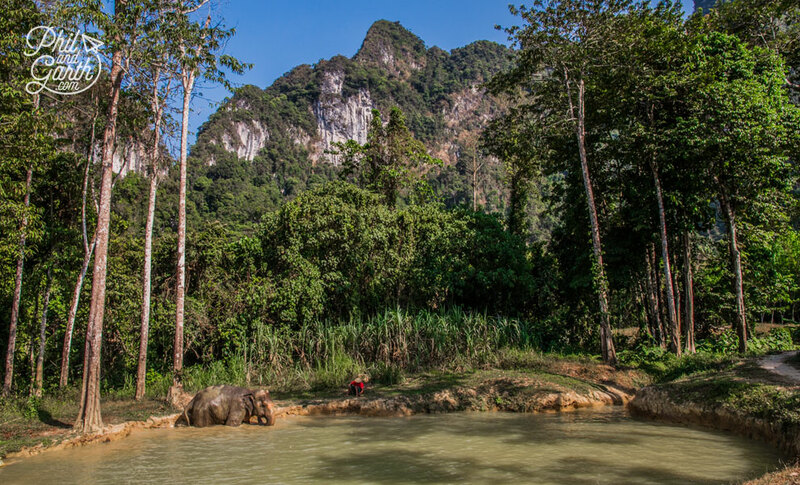 so you could sit back and really take in the beauty of Khao Sok. It was really beautiful with it’s soaring and dramatic limestone mountains with lush vegetation. Along the way, the guys would stop and point out wildlife in the trees, such as monkeys! Our first glimpse of the elephants! Well it’s all about the elephants really, that’s what we were really waiting for. 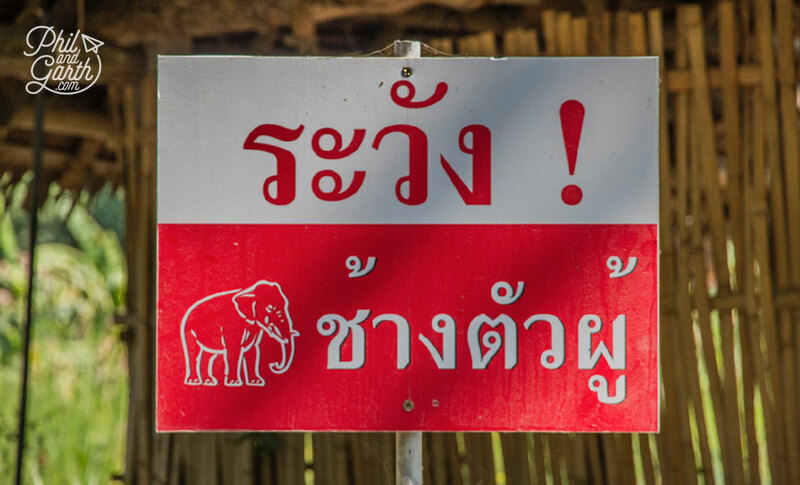 After a short minibus ride from our accommodation, our anticipation of seeing elephants up close was building. 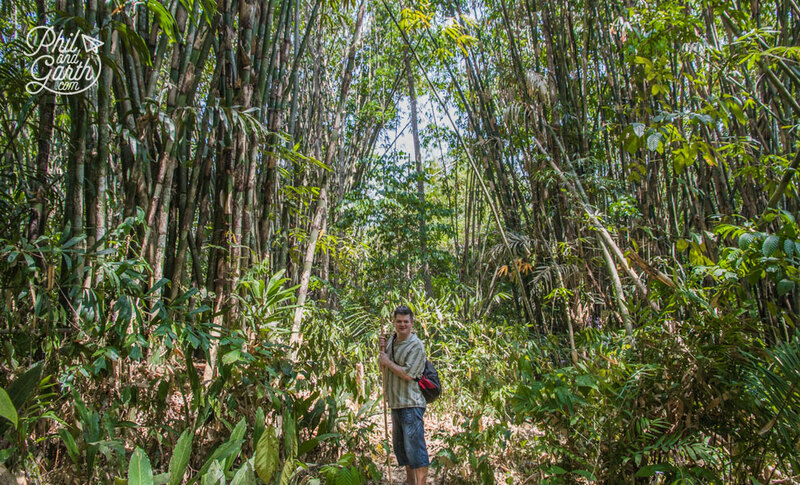 We learnt so much from Bamboo, our excellent guide, she was very knowledgeable, really bubbly and had some great comedy timing too! It’s clear their ethos was about conservation and not entertainment. The day with the elephants was absolutely great, we were up close and it’s very personal. We spent about 3 hours with them bathing them, making lunch for them and getting to feed them too. 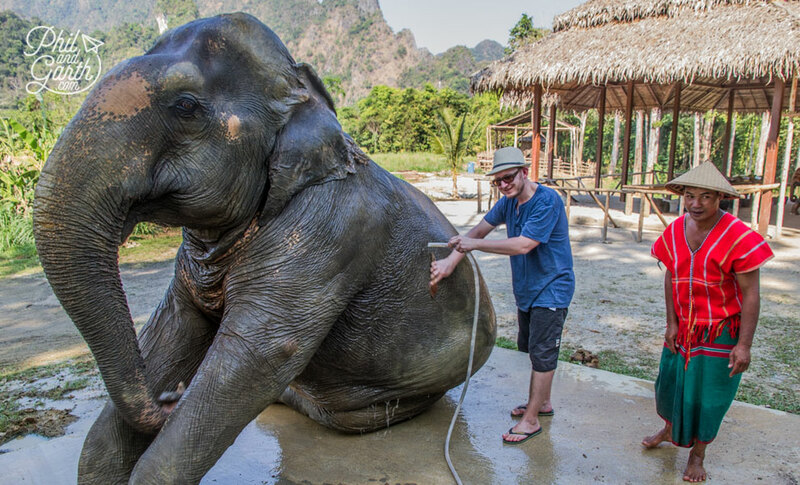 Bath time, they love it, it took the Mahout ages to get her out of the water! 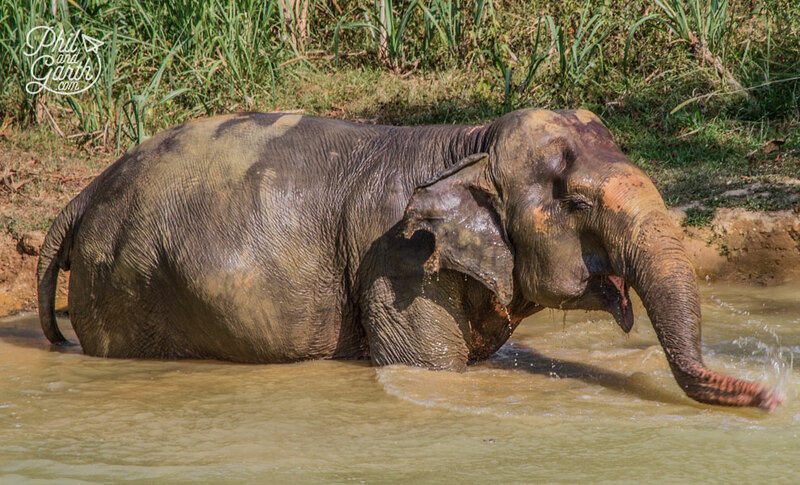 First up we watched the elephants bathe in the muddy water. You could tell they were really giddy when they realised they were heading to the water! Next it was time to clean them with water and a scrub down with coconut husks, great bit of recycling! Now the main event – We spent some time preparing their lunch. Each couple got paired with their own elephant to feed. 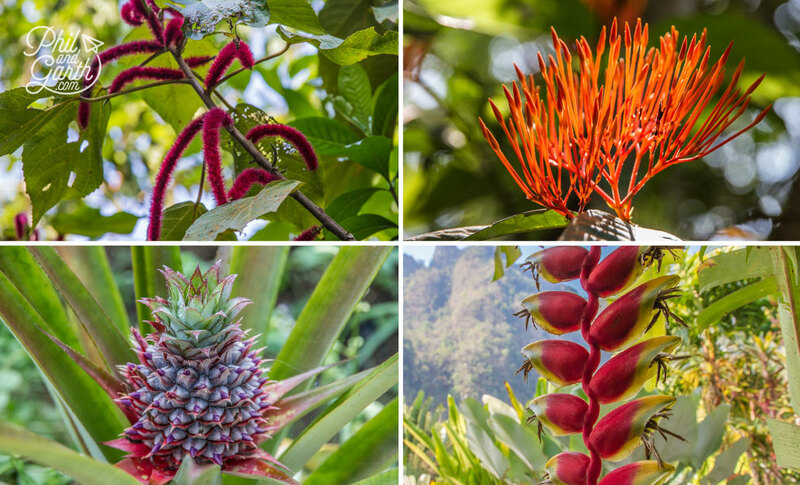 A diet of pineapples, bananas, sugar cane, and multi vitamins wrapped in a banana leaves. Our elephant was smart and knew exactly what we were trying to do with the sneaky wrapped parcel. With his trunk he unwrapped the banana leaf, ate that and left the vitamins! and his favourite was the sugar cane! We also met Ha Ha, their baby, so cute, we had the opportunity to feed her too. 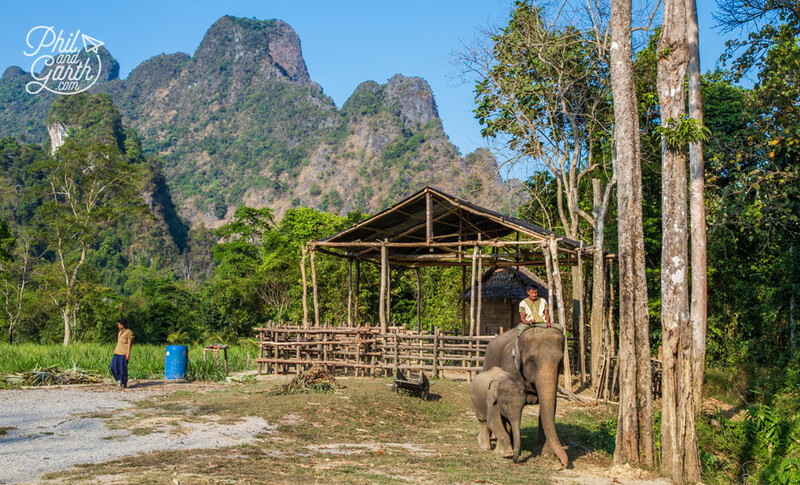 Phil was worried that it may feel like we were exploiting the elephants, however it was clearly explained why they were there, it was as part of a breeding programme and because there was no more logging in Thailand’s national park, where some used to live and work. 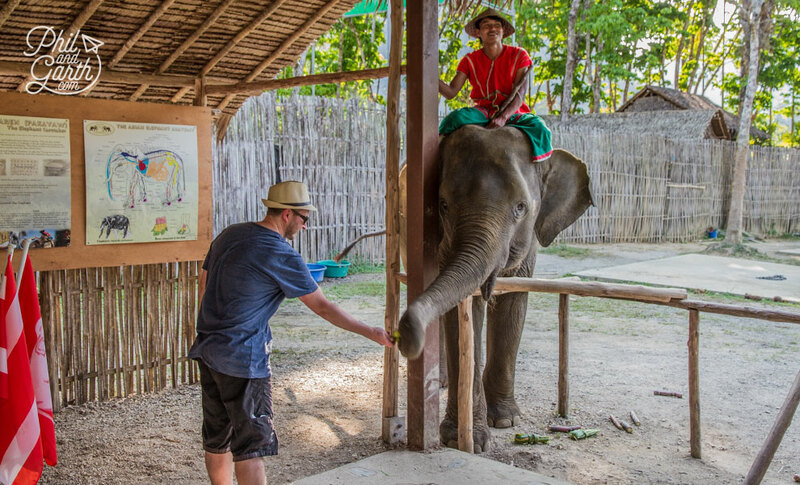 The elephants were so very well cared for by their Mahout (an elephant keeper) and we didn’t see anything that concerned us, even the pole and hook they used was explained. Thai food demonstration, then you get to eat it! Evenings had a great atmosphere, as we listened to all the strange wildlife sounds in the dark. 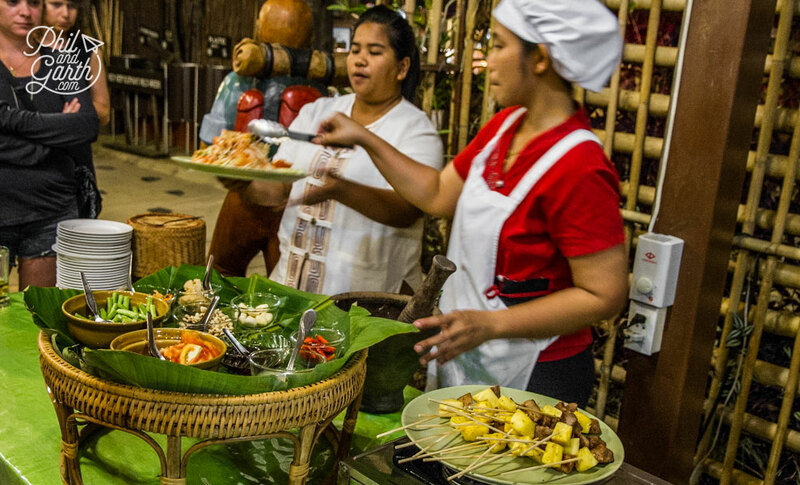 Before dinner there was a cookery demo – papaya salad, yum yum! You could sit at communal tables or as couples, it was up to you. We got chatting to a couple from Copenhagen who agreed with us that the Thai food served here was of a very high standard and delicious! You could order extra drinks, and given they had a captive audience, drinks were not expensive, which we thought was really good. 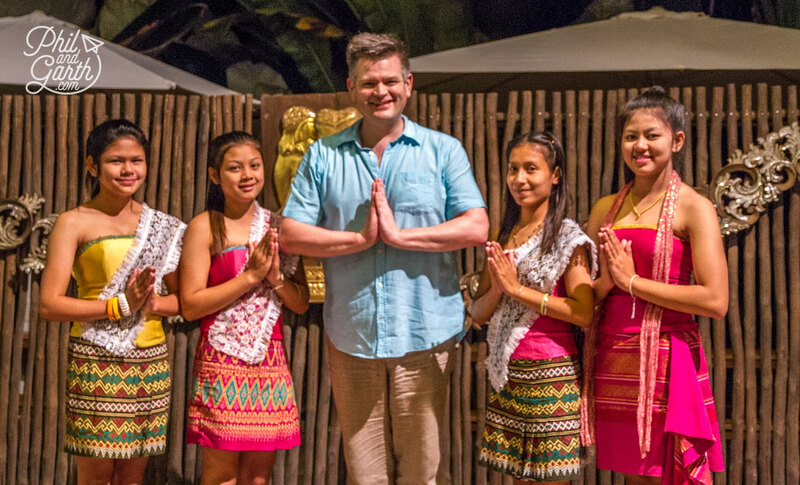 Dinner was followed by a traditional Thai dancing demo from a local school that was supported by Elephants Hills. We also took part in a jungle trekking experience. 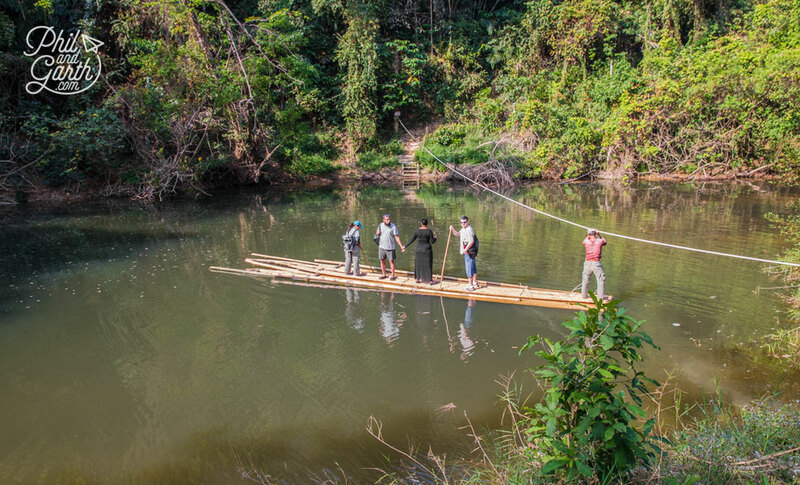 It started with crossing the river on a bamboo raft in small groups. 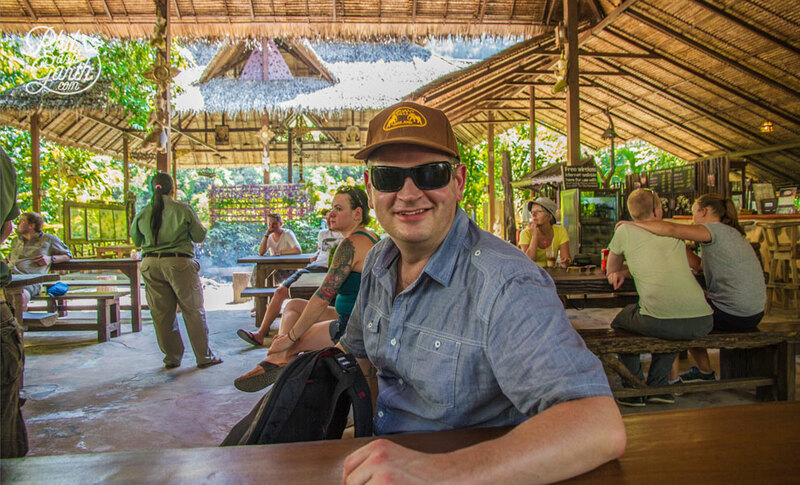 A great time was had by all and don’t worry it wasn’t too difficult, just really a leisurely hike through the lush rain forest with our guide who explained all the local wildlife and nature that we came across on our trek. The hike was about 4 hours. We were warned to keep looking out for snakes, but didn’t see any fortunately. We did love the incredibly long vines hanging from the trees, which allowed us to do our best Tarzan impressions! 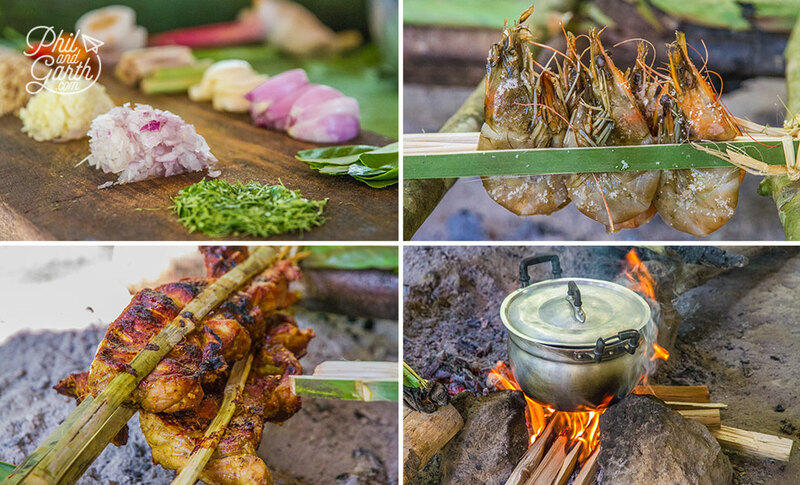 At the end of the trek, we were treated to a great cooking demo of coconut soup, BBQ pork and pineapple, plus a veggie alternative, that we all enjoyed once it was cooked. 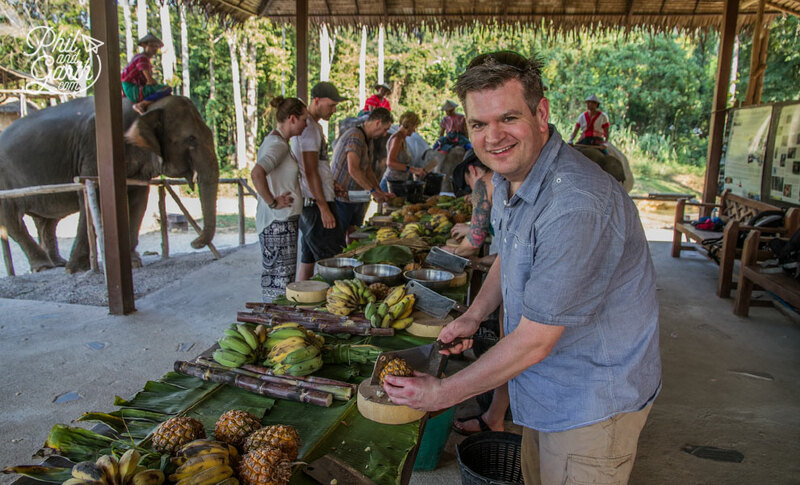 You could get involved if you wanted to, and ask lots of questions about cooking and Thai cuisine, which Phil did. We stayed for 1 night, with 2 days of activities, given how much we did, it didn’t feel rushed at all. We also had time to take a kayak in the water, do a bit of exploring, and go for a dip in the pool which we highly recommend. 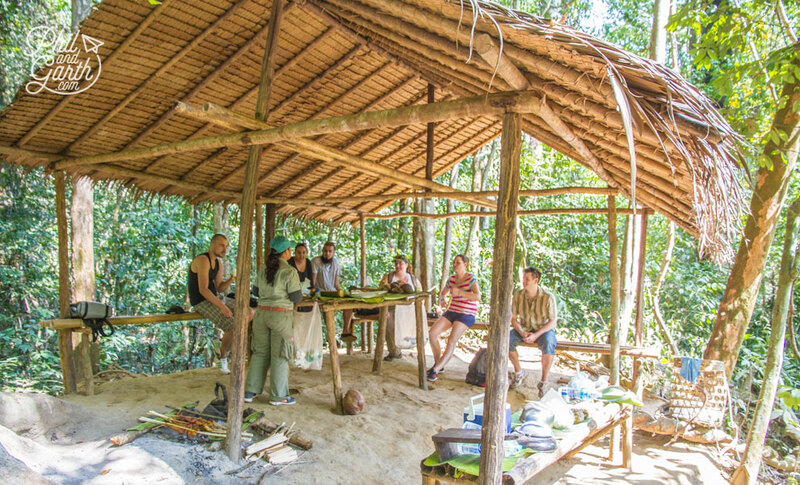 Considering you are right in the middle of the jungle and this place has running water, proper toilets and ice cold beers – we got luxury and most of all a unique experience that connects you back to nature. 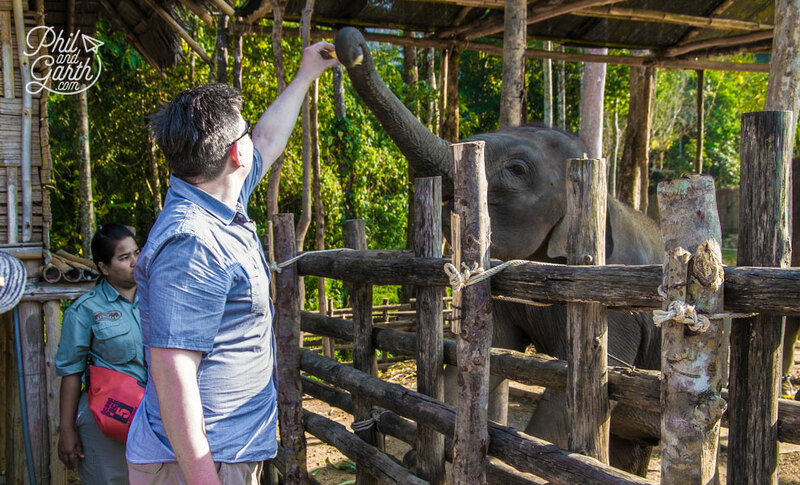 This was a once in a lifetime trip, and definitely ranked as one our main highlights of visiting Thailand. 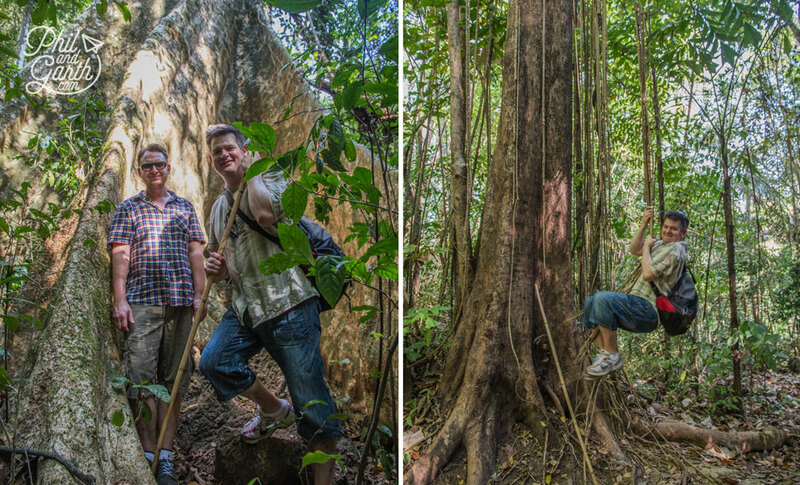 Tip #1: The Jungle hike, you don’t really need hiking boots if you short on space, good trainers would do. Tip #2: It’s hot and humid, try keeping a cool air spray like Magicool handy. Tip #3: Douse yourself in mosquito spray in the evenings – we did, Garth only got one bite. Tip #4: It’s luxurious, but don’t expect powerful hairdryers, as they consume too much solar power. 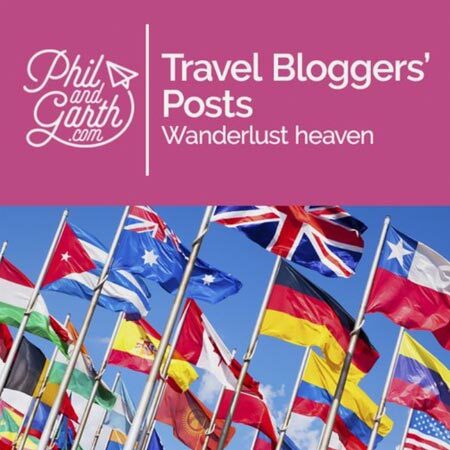 Tip #5: Transfers are long to Phuket, so take some entertainment or your own travel pillow. We are back in Thailand in February and staying in Khao Lak. We are planning a trip to Khao Sok. What an experience you had, it looks amazing and a beautiful place to visit. Your photography is excellent! 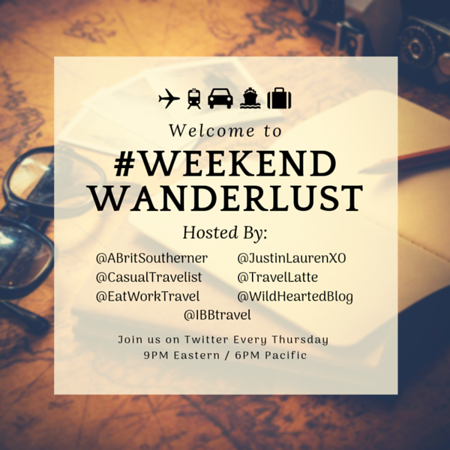 Will be pinning this for our trip, thanks for sharing! Paul, Carole, it’s really beautiful enjoy your visit! 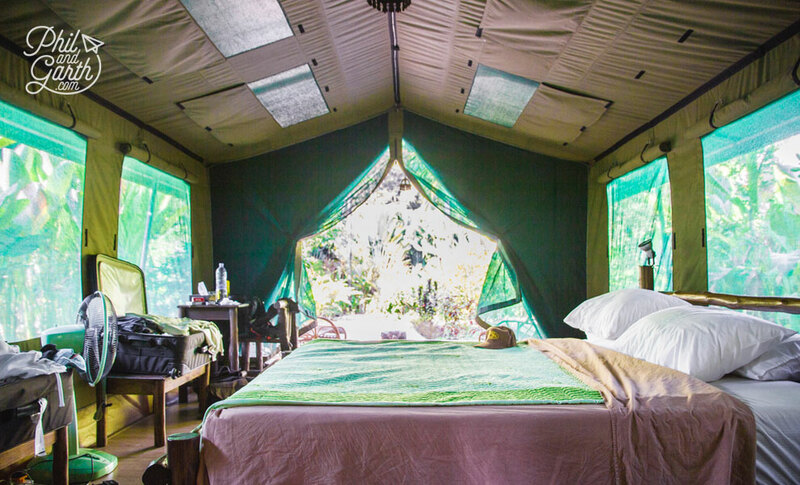 Wow – you guys seriously know how to glamp! 😉 Also, given that spread, I think I want to come back as an elephant and live there. Awesome post, guys. And good tip on the mosquito spray, and the bugs in general; that’s one thing that will make Ann veto any outdoor outing. 😉 -Rob. Fantastic post! I love how the video goes along perfectly with it all. 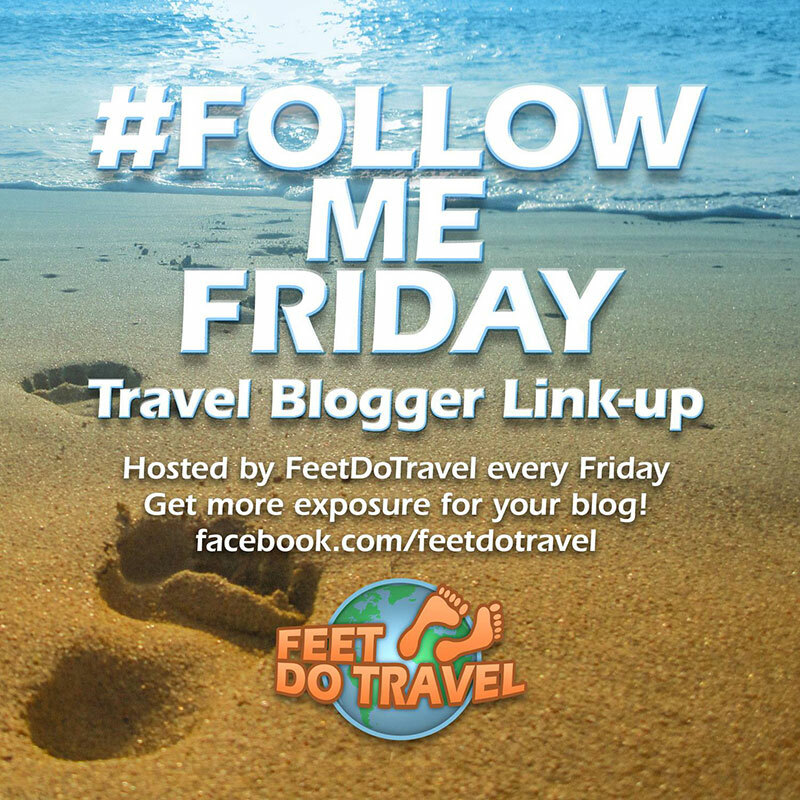 I think I will have to visit Khao Sok after this post and all of your great photos. Thanks for the kind comments Helena, we really enjoy producing the videos. 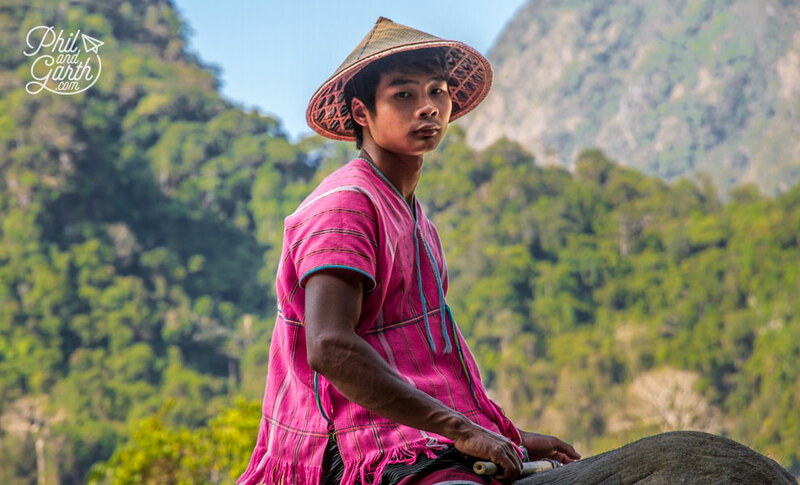 You must go to Khao Sok if you have the chance, everywhere you look is a picture. 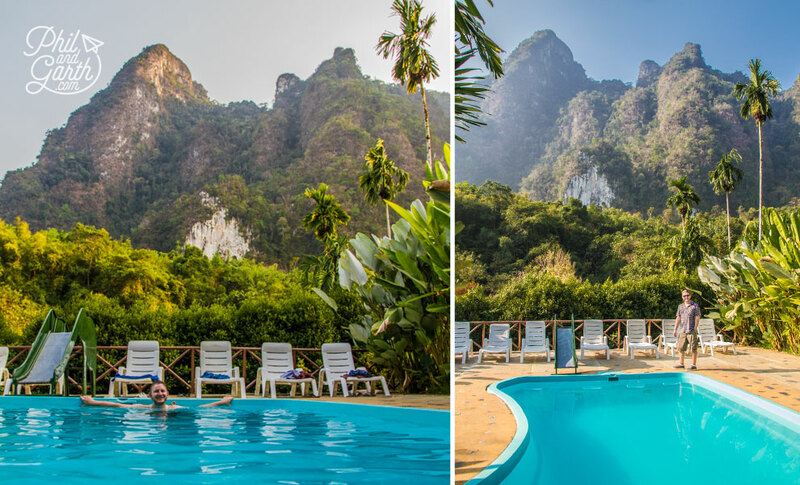 Khao Sok looks fantastic, especially that pool! 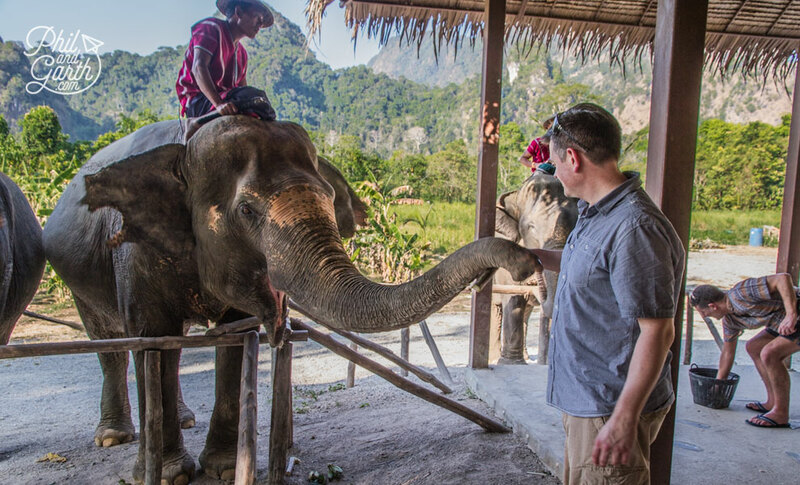 I like that you found a way to interact with the elephants without riding them, something I unfortunately did before I knew better. Noted for my inevitable return to Thailand. Loved this post and as always you guys take great pictures. Would definitely love to visit there. 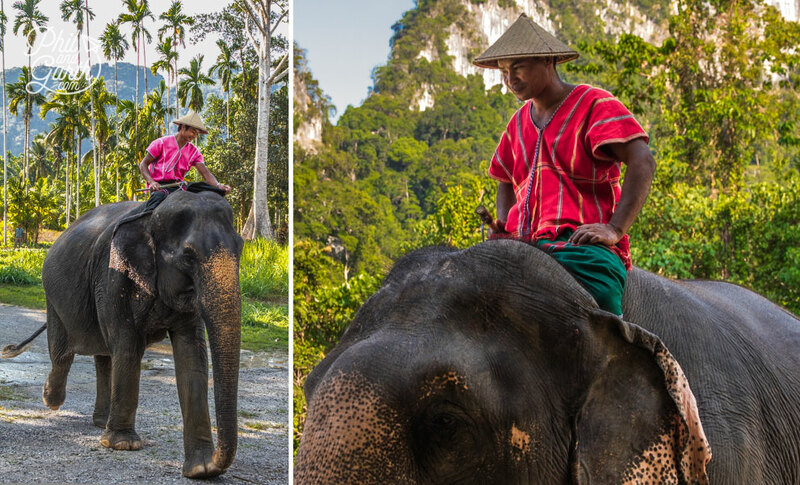 What an amazing adventure to the Elephant Hills Camp in Khao Sok. The video was fantastic along with the pictures. Next time I’m in Thailand I will need to check out this place. It will be bookmarked to save for later. Thanks for sharing!